Do you know how many enquiries you receive that don’t result in a booking? It’s a captive audience you’ve got right there. These are potential guests who have already gone through stages one and two of Google’s Travel Buying Cycle (Dreaming and Planning) but their journey has come to a standstill. Something has stopped them from progressing to the next stage – Booking. Here’s how you can help nudge them back on track. If you use SuperControl PLUS or AGENCY (and you use enquiries), you can easily identify who has enquired through SuperControl (both through your website and those you have added in manually) by doing a quick search. In your SuperControl account go to Database > Filter. 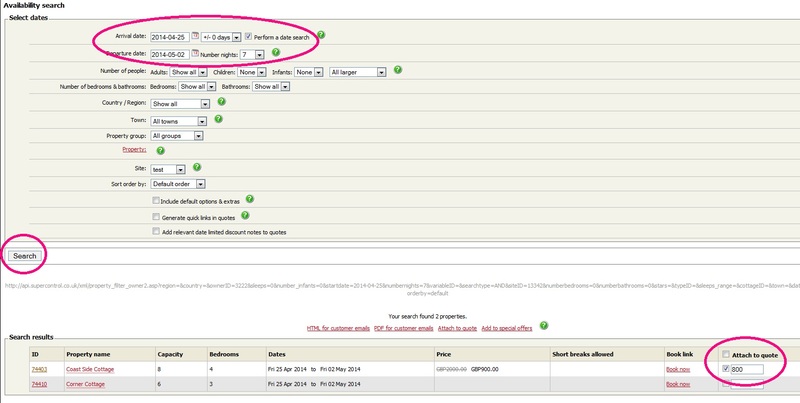 Here you can narrow down your search criteria by selecting a certain date range. In the Date type dropdown select Enquiry date, then in the Booking type dropdown box at the bottom of the page select Enquiries only, then tick Exclude booked customers. You can also filter further by e.g. the property, party size or booking duration. You will then see a screen that gives you the option to download a spreadsheet or integrate the list with MailChimp. Do you know why your potential guests never proceeded to book? Did you provide them with the information they asked for? If you didn’t have any availability when they originally enquired, has anything changed? Can you accommodate them now? Go to Enquiries > View / Edit. Search by Arrival date requested. Go to Bookings > Availability search. Select the arrival date you need to fill and the number of nights that have become available. The Search results will display at the bottom of the screen. Here you can change the price (circled bottom right, n.b. this price will NOT appear on your website), and tick Attach to quote or choose from the PDF or HTML version to copy and paste the quote into an email. You can also select� Add to special offers; if you use the Facebook app this would then show on your Facebook page or you could send a mailshot through MailChimp (please see the training video in the help section of your SuperControl account to find out how). If you are sending an email think about what other marketing tools you use that you can add to your message. Photos, reviews, guest book comments, even a screenshot of a Facebook comment all provide social proof and help to reinforce your message. After you have sent your message it is important to monitor the response you get. Did your message work? Typically the people you have contacted will either be prompted to place a booking, will re-engage in a conversation with you, or you will get no response. It is a good learning experience, enabling you to discover what sort of messaging works (and what doesn’t) and helps you get the right message to the right people. If you have one or two properties you probably won’t have a very high number of people who still do not place a booking or respond in any way, so why not pick up the phone and talk to them to find out why. If you own or manage a lot of properties then the numbers will likely be higher so you might want to send them a questionnaire; there are free tools you can use to do this (including Survey Gizmo). Maximise response rates by providing an incentive to the recipients to complete and return the questionnaire (e.g. entry into a prize draw to win a free holiday). The results may help you discover where your messaging could be improved, or if there is something about the booking process that stopped potential guests from proceeding to place a booking. Remember that even if following up those enquiries doesn’t lead to an immediate influx of bookings, it could benefit you in the longer term. Getting in touch helps to humanize the relationship. It can make them feel valued and gives the enquirer a glimpse of the person (or people) working away behind the scenes. You noticed that they had enquired but not booked and you made the effort to put this right or find out why. That in itself is often appreciated and may be talked or tweeted about.